Love does not loathe or bind, When it's true, pure, and kind. When through realization we come to understand the divine energy that causes us to exist and grow, we cease to impede its natural flow in and through ourselves. When through realization we become aware of this divine virtue within ourselves, our inner nature is enlightened, with the result that our outer nature inevitably is transmuted. Absolute liberty, just and true liberty, equal and impartial liberty, is the thing that we stand in need of. The man who does not do his own thinking is a slave, and is a traitor to himself and to his fellowmen. I used to believe in freedom of speech until I had to pay my first phone bill. 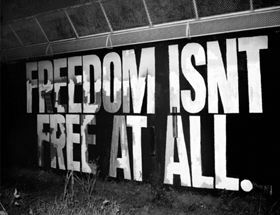 Freedom should never be misused though. As a responsible individual of the society, all of us are responsible for our actions. In the words of Mohandas Gandhi, “Freedom is never dear at any price. It is the breath of life. What would a man not pay for living?” Freedom is something that infuses life in our spirits and should be made the maximum use of.